According to a 1810 dated will, an ancestor of the Kelly family built Lack Mill. Members of the Kelly family from California visited the mill which can be viewed on our Clare River walk. The Kelly’s once ruled large swathes of East Galway, and some of their descendants occasionally visit the ancestral lands from afar. Not one but two branches of the clan came transatlantic in recent weeks. The Kellys from California came to call in Milltown, where according to a will dated 1810 their ancestor built a mill at Lack. The Mill known as Bermingham’s Mill, is now high and dry beside the Clare River, which has been drained over the years. It makes an attractive stop on the Milltown River Walk. The day the Kellys came to visit was one of the many wet days of this summer, but fresh from high temperatures and near drought conditions, the Kelly’s did not mind a little moisture. The weather was better when the O’Kellys from Hudson, Wisconsin, visited Jean Healy Joyce at Gallagh, Brownsgrove, Tuam. 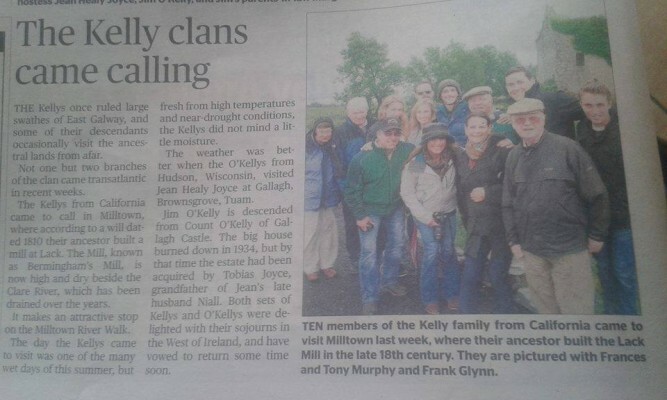 Jim O’Kelly is descended from Count O’Kelly of Gallagh Castle. The big house burned down in 1934, but by that time the estate had been acquired by Tobias Joyce, grandfather of Jean’s late husband Niall. Both sets of Kelly’s and O’Kelly’s were delighted with their sojourns in the West of Ireland, and have vowed to return some time soon.